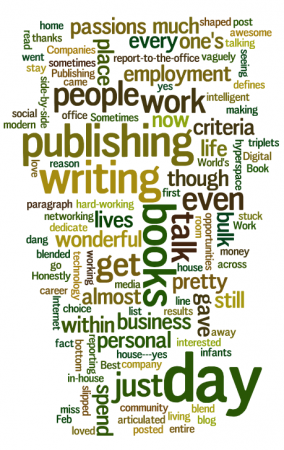 I just came across Digital Book World’s Feb 7, 2012, blog post “Best Publishing Companies to Work For.” I was vaguely interested in seeing how their list shaped up, and what criteria went into it, so I gave it a read. But the results and criteria have pretty much slipped away from me. What has stuck is the first paragraph, which I posted above. They’ve articulated the very reason I loved working within a publishing house—yes, it’s a business, and yes, the bottom line is making money for the company so that it can stay in business, but it’s pretty dang awesome to go to work side-by-side with people who love books and writing so much that they’ll dedicate their lives to it. And that’s what a career is, a choice that defines your entire life. Those who work within a publishing house have blended their personal passions and their employment, and it’s a wonderful place to spend one’s day. Sometimes I miss reporting to that office and talking books and writing with these “intelligent, hard-working people” almost every day, for the bulk of my day. But only sometimes. The fact is, even though I work from my home now, I still get to talk books and writing almost every day, for the bulk of my day. I just do it through the Internet. Honestly, the publishing community lives in hyperspace! And I get talk talk books and writing with even more people now because of the networking opportunities of social media. So even though I gave up the report-to-the-office, in-house publishing life when my triplets were infants, thanks to modern technology, I can still blend my personal passions and my employment … I just get to do it from my living room. And that’s a wonderful place to spend one’s day. I’m right there with you! Love working from home and STILL getting to interact with the wonderful publishing/wholesaling/library community!! What a lucky girl I am, too!